The Aston Villa Appetiser – Benitez on Villa and is it Revenge Time vs Chelsea? A+ With Villa close to crossing the line of safety it’s perhaps not an ideal time to meet Chelsea, who seek a win to guarantee their own target – a Champions League place. While a point would be great in terms of taking matters into our own hands (instead of looking down the table), it will be a very tough match against the most in-form side of the Premier League. Chelsea: Last five Premier League matches away: W 2, D 1, L2. In the last five meetings at Villa Park, Villa have won once, drawn once and lost three times. There are reasons to be cheerful at Villa Park after a run of good results, but our record against Chelsea is ominous. We’ve had some massive wins in the last few weeks but our home record has been a cause for concern – three wins in our last 11. In our last home game we inflicted a cricket score but we also saw that against Chelsea in December (it’s still a cause of nightmares for many) and although Villa have certainly improved, Chelsea’s confidence will be sky-high after getting to the Europa League final and winning at Old Trafford. Many feared the worst after our 8-0 loss as it seemed to undo the good work we’d done before that – a five game unbeaten run and a victory at Anfield. Credit where credit is due though, Lambert persevered with his team and we’re now 13th with an improved goal difference. Chelsea might be top of the form table, but Villa currently boast the form of a top-six side and won’t be shy of confidence with what looks likely to be a sold-out Villa crowd behind them. If we show the confidence that was evident against Sunderland we might be able to take something from the game. At times it seems like Chelsea have a never-ending fixture list, and while they’ve impressed during their last few games signs of complacency and fatigue might be their downfall this Saturday. While Chelsea look forward to a final in Amsterdam in a few days time, Villa are under no illusions regarding the precarious position they are in. It’s nice for us fans to seek solace in the likelihood of the relegation battle mathematics but Lambert and his team won’t feel relaxed yet. 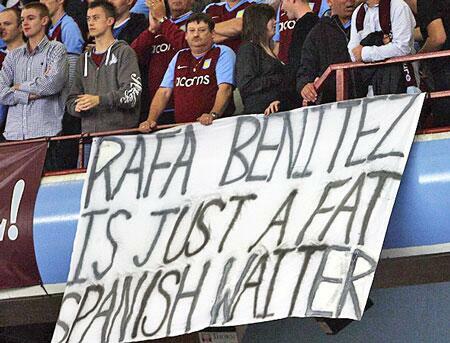 We can be sure that Villa will give it a real go against Chelsea. UTV. Like every football fan, I wish Petrov all the best with his retirement. A true Villa legend. While a point would be a big relief and put the onus on Wigan, Newcastle, Sunderland, and Norwich to get three points to draw level with us, I’d so love to deliver an embarrassing scoreline to Chelsea. While I don’t think there’s any chance we would even the season tally on aggregate, a nice 5-1 thumping would be so sweet.